When Jacques Brandenberger invented cellophane, consumers loved it. Clear plastic food packaging transformed the way we purchased food, as well as how producers sold it. Plastic food packaging often seems obviously wasteful. But when Jacques Brandenberger invented cellophane, consumers loved it. It helped supermarkets go self-service, and it was so popular Cole Porter put it in a song lyric. Nowadays, people worry that plastic doesn’t get recycled enough but there are two sides to this story. 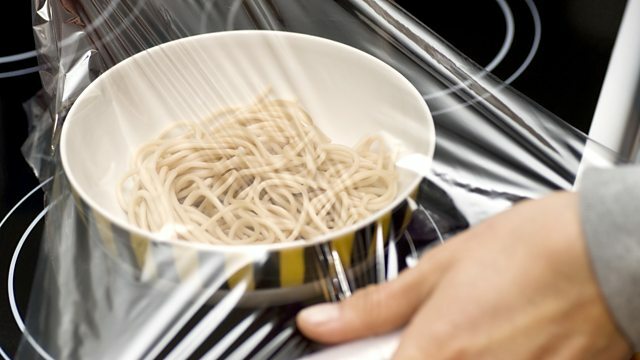 Plastic packaging can protect food from being damaged in transit, and help it stay fresh for longer. Should we care more about plastic waste or food waste? As Tim Harford explains, it isn’t obvious and the issue is complicated enough that our choices at the checkout may accidentally do more harm than good. Plastic: The Making of a Synthetic Century. Stephen Fenichell. HarperBusiness, 1996. Inventors of Food and Agriculture Technology. Heather S. Morrison. Cavendish Square Publishing, 2015. Science and Corporate Strategy: Du Pont R and D, 1902-1980. David A. Hounshell, John Kenly Smith, Jr. Victor Smith. Cambridge University Press, 1988. How to Make Money Selling Meat, Craig Davidson and Fred Orval Briton. Progressive Grocer, 1938. Plastic – The Elephant In The Room. Sam Knight. Financial Times, 26 April 2008.